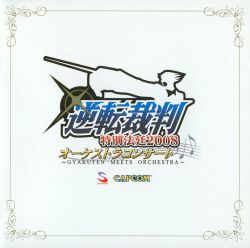 Although Hideki Okugawa wasn’t credited in booklet, he composed the track “Pressing Pursuit ~ Cornered” in “Gyakuten Saiban 4 Courtroom Suite”. "Gyakuten Saiban 1~3 Courtroom Suite": "Gyakuten Saiban 2 - Prologue ~ From J.S. Bach 'Toccatta and Fuga in D minor BWV565'", "Gyakuten Saiban - Trial", "Examination ~ Moderate 2001", "Investigation ~ Overtaked", "Gyakuten Saiban 2 - Trial", "Examination ~ Moderate 2002", "Investigation ~ Cross-examining", "Gyakuten Saiban 3 - Trial", "Examination ~ Moderate 2004" and "Investigation ~ Cross-examining"
"Gyakuten Saiban 4 Courtroom Suite": "Gyakuten Saiban 4 – Trial", "Questioning ~ Moderato 2007", "Questioning ~ Allegro 2007" and "Pressing Pursuit ~ Cornered"
"Villain Suite": "Ganto Kaiji ~Swimming, Anyone?~", "Koroshiya Sazaemon ~Whim of a Murderous Gentleman" and "Phantom Thief Kamen Mask ~Listen, Pleeeeeeeeeease!~"